Description: If you are frustrated by the limitations of the Windows command line, then 4NT is the one command line tool you truly need. By adding thousands of features that Microsoft omitted, 4NT makes the command line easy to use, giving you more power and flexibility than you ever imagined. 4NT replaces the Windows command processor, (CMD.EXE) the brains behind your command prompt. Description: Want to improve your productivity and workflow? Compiling information from different documents for project bids, websites, technical documentation? Having phone conferences about projects? Open several windows at once? Simple and elegant program Actual Title Buttons will resolve your problems easily and brilliantly! If you switch between documents, use Minimize to Tray, Roll Up or Stay on Top. Organize your desktop space! Try it now! Description: Aml Maple is a simple-to-use piece of kit that indicates the current language configuration of the keyboard. It comes in handy when you are juggling multiple projects in different languages at a time, such as writing a paper for school or preparing a work assigning while talking to friends on Facebook. In addition, you can change the text cursor color, move it beneath the cursor instead from the right, adjust the text cursor width (in pixels). Description: Captain Tray Pro is a simple and effective tool for tray management. You probably have a file manager installed on your computer, which you use to manage your files. Now you can use Captain Tray Pro to manage your Windows. Description: FREEWARE program for cybercafe or internet cafe automation and technical administration. Billing, limiting internet speed, increased security, enhanced usability, customizable interface. Hundreds of internet cafes now are under ClubControl billing and they didn?t ever regret about it. That?s because ClubControl software has all necessary features to manage internet & cyber cafe and much more. Description: Tired of wasting your time browsing for folders and files? Dialog Box Assistant greatly speeds up access to your data. It extends the standard Windows Open and Save dialog boxes with the lists of the recently used folders and files. Even in the Microsoft Office?? ?maintains list of recently used folders and files in every program. Also you can open your favorite folders using screen menu, available by pressing the hot keys. Description: Disputing display resolution and brightness settings with your colleagues or kids?! Stop the squabbles with this program! This is a utility that allows multiple users sharing a computer to set their own display resolution, brigtness and contrast options. It will switch monitor to the preferred resolution when the user starts working. System admin can set the default display resolution for all users and for when no one is logged on the system. 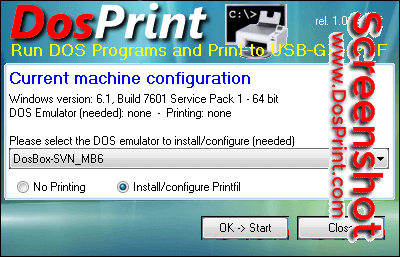 Description: DosPrint allows you running DOS programs on modern Windows computers (64 bit too) and printing to Windows printers (including USB, GDI and PDF) by installing specialist third party programs specifically designed to solve these common DOS problems. It checks if you've a 32/64 bit Windows version (in the last case a DOS emulator is needed to run a DOS program, otherwise Windows itself is enough), and selects the best additions for you to install.